If you've reached the point where you need comprehensive addiction or mental health services, call BlueSky Behavioral Health. We offer an innovative, in-residence treatment program. Our Enhanced Treatment Program (ETP) is the perfect middle ground for those who want to focus on their issues but do not need to be hospitalized. Contact BlueSky Behavioral Health today for focused treatment of anxiety, depression, PTSD, addiction and other behavioral health services for people from throughout the United States. Our Enhanced Treatment Program (ETP) is an in-residence program that allows clients from anywhere in the United States to receive our nationally accredited clinic treatment services. Clients are provided a furnished rental apartment (from one of our participating rental agents) so they can attend our daily clinical and life coaching programs for the treatment of mental health or addiction disorders. ETP's in-residence program in not a residential treatment program. Clients enjoy the same freedom and independence as they do at home while receiving excellent professional care. If you believe that you or a loved one could benefit from our Enhanced Treatment Program, please contact us right away at 888-822-7348. "There's a community in BlueSky. All of us have gone through similar things. All of us are struggling and we need help, and we're doing it together." 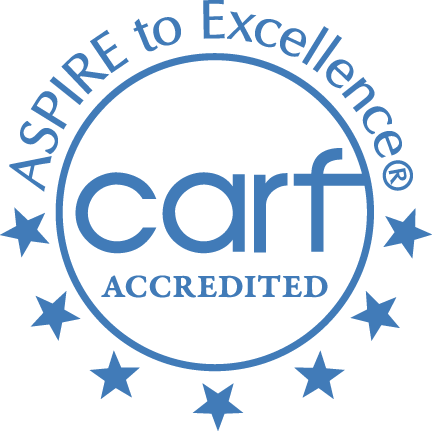 CARF is a national accrediting organization that assures patients that the programs they accredit are among the best in the country. Visit Carf.org for more info. Copyright © 2019 BlueSky Behavioral Health, all rights reserved.